Kenpo Kards are a revolutionary, new training aid. They were painstakingly designed to be useful to practitioners of all age levels and all skill levels. Their beautiful, professional, and simple design often overshadows their in-depth and versitile nature - while at the same time, slowly giving up their hidden secrets - for those who wish to spend the time finding them. Kenpo Kards were compiled from the teachings of the late Sr. Grand Master, Ed Parker, father of American Karate, and beautifully illustrated by his son, world renowned artist Ed Parker Jr. - these cards are a must! Keep collecting for the entire set of these amazing cards! They may be purchased in Tech Paks (randomly sorted groups of 15 kards), Tech Deks (3 deks of 60 kards - each not randomly sorted), or the entire Tech Set (all techniques in the system - not randomly sorted). Prices are available for both the wholesale and retail market. This first round of kards are destined to be the most revolutionary and valuable tool in the learning and teaching process of Kenpo. The front of the Kenpo Kards are designed to be not only asthetically pleasing, but also easily and quickly recognizable from a distance. These features give the practitioner the luxury of placing the kards down, front forward, while still being able to read and recognize each kard at a reasonably far distance. This becomes an invaluable asset when trying to perform your workout. 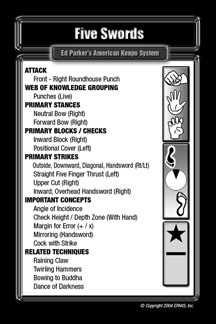 The front of the Kenpo Kards also allow the practitioner to quickly recognize through symoblizm and visual cues what needs to be performed - without needing to read any text. This will aid practitioners that have limited eye sight. The back of the Kenpo Kards are designed to be a combination of text and Graphic User Interface. Research has shown that the human mind reads graphic images or symbols faster than reading text. This not only aids the practitioner or instructor in quick sorting and grouping, but also gives the practitioner new ways of looking at and new tools for mining information out of their material. 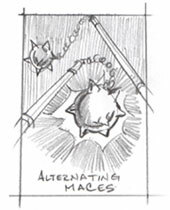 One can think of the backs of the kards as a digest of informatoin about the material represented on that card. A complete breakdown of how to use the Kards are in "The official EPAKS Guide to the Kenpo Kards". Kenpo Kards are specifically designed to allow the practitioner to explore new ways of traing and learning the kenpo system. What we present here are just some examples of the many ways Kenpo Kards can be used to aid the practitioner in not only expanding their kenpo knowledge, but also expanding their training regiment. We feel there is nothing like them in the martial arts industry today. We hope you enjoy using them as much as we enjoyed designing them! Instructors can design a single class or seminar, an entire belt rank, or the entire system around the kards. Students can use the kards to explore new ways of perfecting and optimizing their workouts. Probably, the most generic way to use Kenpo Kards in a single workout session is to pre-sort and group the kards into small, easy to manage paks. Then, either line them up against a wall, front facing forward - or, have someone call the techniques out for you. Sorting and grouping of the Kenpo Kards can be done in a large number of ways - rank, attack, side, direction, family grouping, etc... The possibilities are endless. 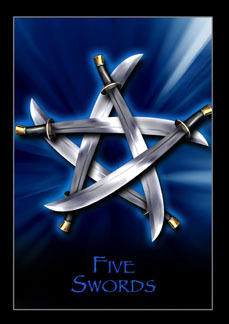 In general, the front of the Kenpo Kards are more useful when the practitioner needs to view the kards from a distance. While, the back of the Kenpo Kards are more useful for close-up viewing, sorting, and learning. 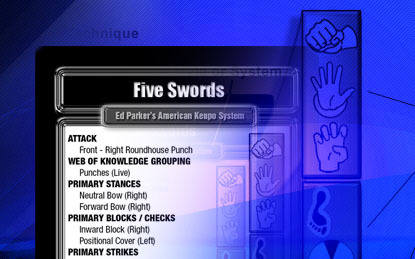 Kenpo Kards is a classic story of filling needs and ingenuity. We in EPAKS have felt that there has always been a need to better serve one of the largest groups of people in the Kenpo industy - the younger practitioner. American Kenpo has always catered mainly to the adult audience, but has always expected the younger crowd to learn and get excited about Kenpo, in the same ways as the adults. Even, all the Kenpo literature was targeted strictly for adults. We in EPAKS have also felt that since the passing of Ed Parker Sr., there has been a serious lack of information dissemination and innovation with American Kenpo - An art known and respected for its innovative and thought provoking ingenuity. Now a days, people have to rely mainly upon “the seniors” and seminars to get any in-depth information about American Kenpo. Along with the above needs, we also had a vision of simplifying, energizing, and revolutionizing the design and execution of workout sessions. We felt that the old standard of trying to remember, find, and execute a technique of a specific type, description, attack, family grouping, etc. from across the room was far too inefficient and time consuming. One usually had to hunt lists of required techniques to find the ones they were interested in performing. And, hopefully, just hopefully, you could scan the lists and find them all - while simultaneously executing them one at a time. The answer to all these problems and more - Kenpo Kards. This totally revolutionary concept is intended to add a breath of fresh air, thought, and excitement to practitioners of Kenpo – of all ages and skill levels. It is our hope that you will find that the more that you use and study the kards, the more you will find yourself wanting to use and study the kards. 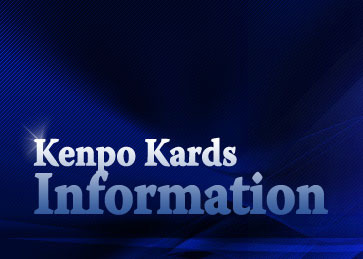 So, please take the time to learn more information about Kenpo Kards and how to use them. And, we are sure you will come to the same conclusion as we have – Kenpo Kards change the way you see and practice your Kenpo – forever! We sincerely invite you to take the time to let us know what you think about the kards, the new ways you have found to use them, and what you have learned from the kards. Also, feel free to give us any suggestions or ideas you may have about the kards. Finally, we in EPAKS intend for this to only be the first chapter of a new book in the continuing story of American Kenpo. A new book coming from the current generation of innovators, thinkers, and practitioners – but intended for all past, current, and future generations of all ages, talents, and levels.